I am really pleased to have been announced as the 2017 winner for the Masters of Wedding Photography UK and IE Competition. The competition has four rounds through the year where photographers submit images so the judges get to see a range of each photographers work. Throughout the rounds there were some amazing winning entries -it is so great to be part of such an inspiring and talented industry in the UK. There have been so many stunning images entered by friends and peers in the wedding photography industry, and it’s great to see my fellow NineDots team all making the top five. As a collective we offer training and mentoring opportunities for other photographers, including the ‘legendary’ NineDots gathering that takes place each year in London in November. Check out NineDots on Facebook. 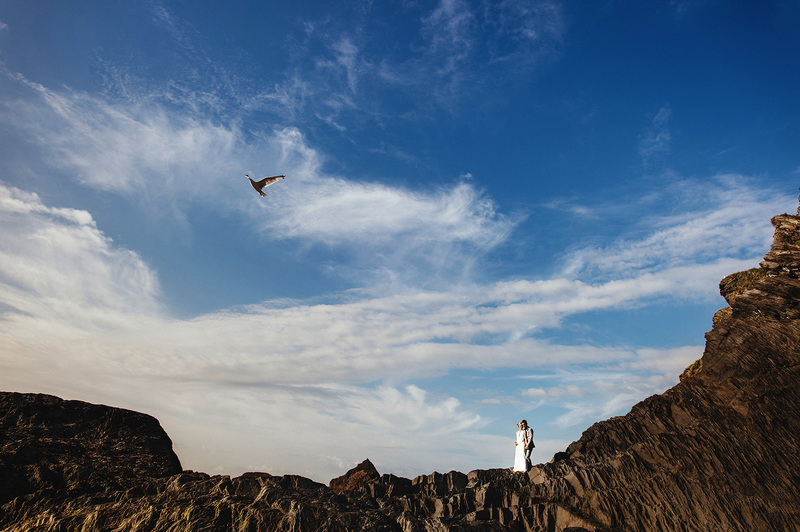 It goes without saying – what matters most to me about wedding photography is creating awesome images for my couples that they love and bring them meaning. I aim to capture how my couples felt on the day, whilst creating them unique art that is ‘them’. I don’t go turn up on the wedding day with long lists of shots I want to make, instead I make the most of the opportunities as they arise – each image is as unique as each couple is. 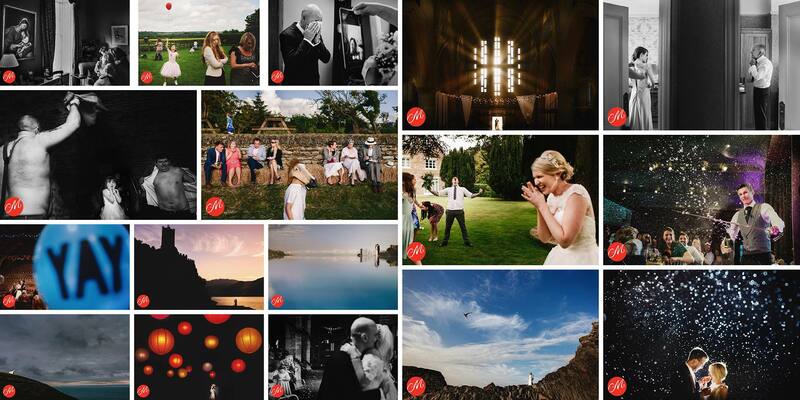 Of the 17 images awarded, I thought I’d share a little bit behind some of my favourite winners! I shoot 99% of each wedding day in a documentary approach – so I try to never influence what happens or direct people. Instead, I love to spend the time looking for artistic and creative shots with what is already there. 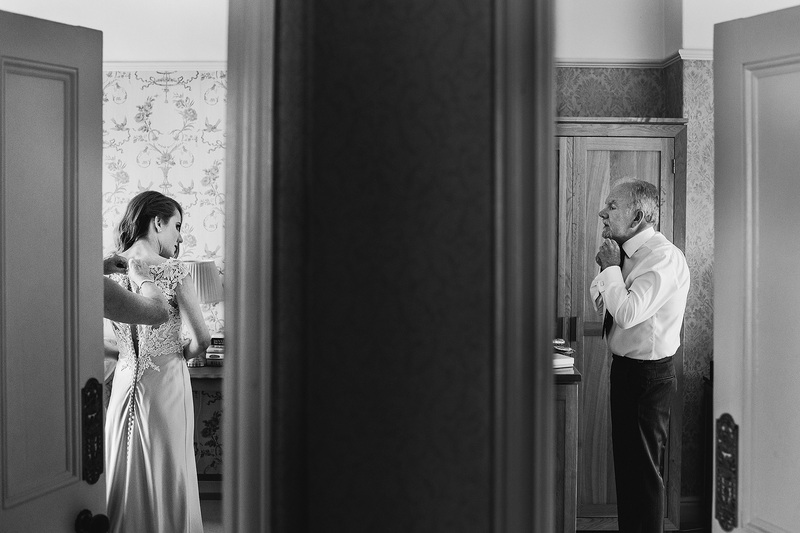 I loved the symmetry of bride to be, Aisling and her father both finishing getting ready in adjacent rooms. There’s always something extra magical when a bride returns to her family home to get ready on the morning of her wedding. That fusion of past present and future really adds to the already heightened emotions! Sam, Gemma and the seagull! Although for the most part of the day I work in a documentary style approach, I do think portraits are an amazing chance for the couple to slip away from the party for a few minutes and take a few moments to just be together and realise how awesome the day is and the fact they are now married. I always aim to fit the portraits in when the opportunities arrive, it may be between the courses of the meal, a few moments as we leave the ceremony – each day is different. For this shot, we only went a few metres from the venue. I love looking for little ‘extra’ things that can help elevate images to be even better – It was a great scene and Gemma and Sam (a good friend and wedding photographer!) were looking totally awesome already, but when the bird flew into shot it brought the extra with it! Some couples avoid wedding traditions, others embrace them whole heartedly. 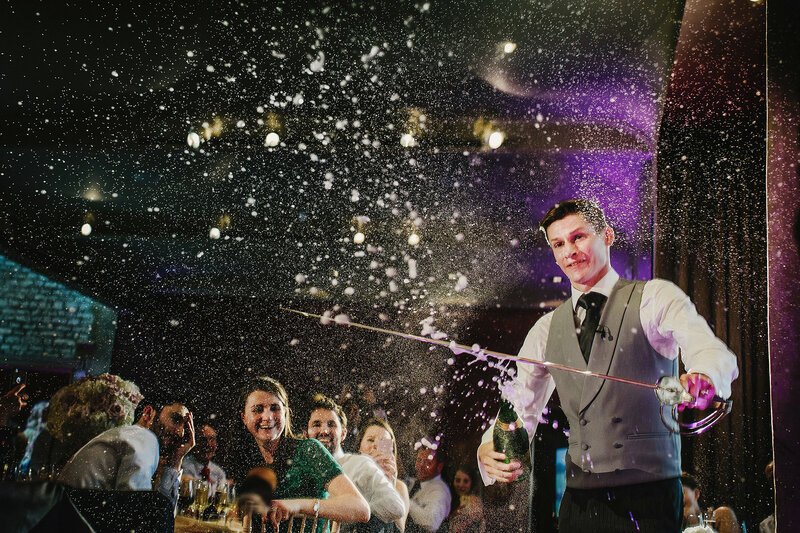 The ‘sabrage’ is a cool tradition that we really need to see more of at weddings – it certainly beats your average bouquet toss or cake cut!. Oli was overjoyed to get the chance to slice to top off the champagne bottle. I knew the best place to capture this was to be right in front of the groom. I got a little wet and covered in champagne and glass, but it was worth it! So far 2017 has been an awesome year, so thank you to the judges, to all my fantastic photography peers and most of all to my awesome couples! Check out more of my work on my website, Facebook and Instagram. If you looking for a photographer – get in touch. I’d love to hear more about your plans! Unbelievably awesome work Andy – completely deserved! Well done! Thanks Dan – very kind words!